Hilton Shillim Estate Retreat & Spa, nest led in the beauty of wilderness in the mystic mountains of the Western Ghats, a UNESCO World Heritage Site and one of the world’s eight hotspots of biological diversity, is a blend of simplicity with contemporary life-enhancing practices. It is a pathway to discover your own journey in serenity. Spread across 320 acres of picturesque beauty, Hilton Shillim Estate Retreat & Spa features 17 treatment rooms and the most comprehensive spa facilities in Asia offering holistic practices in a comfortable retreat atmosphere with a spectacular view to establish healthy habits for life. Shillim spa offers a vast menu of health, fitness and pampering services. The spa integrates the ancient philosophic, spiritual and artistic wisdom of South Asia with modern international practices that re-freshes and re-inspires the body, mind and spirit. The wellness treatments are personalized after an initial consultation with professional lifestyle consultants which will be tailor-made to suit your individual needs. The programmes are a beautiful blend of spa treatments, yoga, meditation and activities that will offer holistic healing. 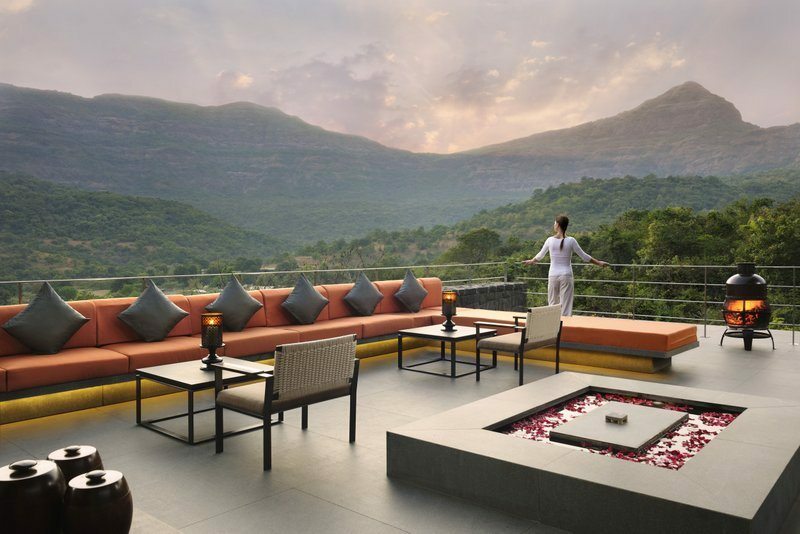 Located amidst the breathtaking landscape of the Sahyadri mountain range in the Western Ghats, Hilton Shillim Estate Retreat & Spa is exclusively located within the undisturbed natural beauty of a private estate, offering complete seclusion and serenity. Traveling from Mumbai guests can take a 30-minute sea plane flight that connects Juhu Airport and Pavana Dam, which is a 25-minute drive from the retreat. The drive from Mumbai to Hilton Shillim Estate Retreat & Spa on the Mumbai-Pune Expressway takes just under 3 hours, and the drive from Pune takes 1.5 hours. There are seven exciting on site restaurant and bar venues utilizing primarily organic and locally sourced ingredients. Guests can enjoy fine dining whilst maintaining a regime of good nutrition and even customize their experience with ‘Dining by Design’, which allows them to choose the setting for their unique meal, be it by the banks of a waterfall, or on a lush forest plateau. Mountain Bar Bistro: Offering spectacular views of Sahyadri, Mountain Bar & Bistro offers a light menu with delicious dishes ranging from pasta to fresh stone baked pizzas. Green Table: Farm to Table concept offering contemporary cuisine focussing on health and nutrition. Located in Spa zone of Retreat children below 13 years are not permitted. Open for Lunch and Dinner on all days. In Villa Dining: 24 hour in-villa to be enjoyed in the villa, balcony or in patio. After 2300 hours options available from the limited choice menu. Guided tours to Raigad Fort, Korigad Fort, Lohagad Fort, Visaput Fort, Tikona and Tungi Fort (arranged on prior intimation on a chargeable basis). Bird Watching at Shillim Institute with the retreat’s naturalist. Designed for healing this all villa retreat is a sanctuary for body, mind and soul. The unspoiled settings complement the organic local cuisine, individual, customized spa treatments and activities. Spa: Customised treatment focussing on wellness and rejuvenation. Celebration: Green Table, The Tea House, Valley Bar, Breakfast at Shillim Peak (on prior reservation), Chef’s Table with set menu, Wine experience at the Reserve, In-villa Barbeque (on prior reservation). World Luxury Spa Awards 2014 – Best Luxury Wellness Spa, Best Luxury Emerging Spa and Best Scenic Environment accolades. This is the first of its kind hospitality project which combines eco, socio and civic responsibility without compromising on quality, combining the stunning location with the world class infrastructure seamlessly. Arranged on prior intimation to Mumbai Airport/City; Pune Airport/City; Lonavala & 8 hours 80 kms (full day package) by Fortuner or Innova on chargeable basis. Need prior intimation of at least 6 hours. The above mentioned rates are applicable one-way, and subject to periodic revisions. Children are welcome, for Villa 2 children below 12 years are not charged. In case of an extra bed request an additional charge of INR 3000++ per night inclusive of buffet breakfast is applicable. Catered to on prior intimation to the Food & Beverage Team. Extension is possible subject to villa availability on the date extension is requested and done on the Best Available Rate applicable for that particular date. Deposit: Required 24 to 72 hours prior to arrival. Cancellation Penalties: Reservations cancelled in a time frame of less than 72 hours attract 1 night villa charges as retention. Prepaid reservations booked on non-refundable, non-cancellable rate plans entire stay for villa charges and taxes is charged while reservation and is not refunded in case of cancellations or amendments under the non-amendable, non-refundable clause. Telephone Call Charges: International Call : INR 200/-+Taxes per minute. Long Distance Call: INR 45/-+Taxes per minute. The retreat has a full service spa facility operational from 0900 hrs to 2100 hrs. Retreat has Laundry and Dry cleaning facility available. Laundry received prior to 1100 hrs is delivered on the same day. Express Service is possible on additional charge. All the villas have 2 lines with voice mail facility. Entire Retreat including outside sitting areas of villas are non-smoking. Smoking is allowed at designates areas. A fine of INR 5000/-+Taxes is levied if traces of smoking are found the villa. Do you need restorative yoga?